The guide came to wake us up at 2.30am. It was still drizzling and the ground was wet. As I did not have a good night’s sleep and my back was aching, I decided to forgo the trek to the summit of Mt. Rinjani! It was a good decision for me as before 7am and while I was still lying in the tent, K C and Kenny suddenly returned to the camp, totally drenched! They gave up well before reaching the summit as the ground was wet and slippery and the sky was foggy. So we all missed the chance to enjoy the amazing sunrise views across the Wallace Line to Bali, Mt. Agung and Aumbawa, the crater lake below, and the island of Lombok stretching far below, which is the main objective of this expedition! 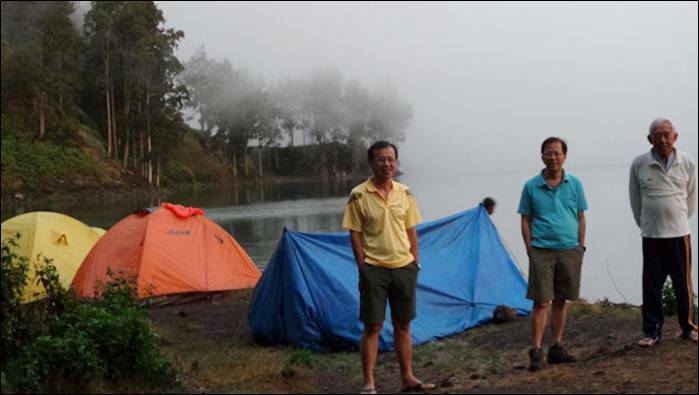 After having our breakfast in our tents, we proceeded to trek down to Segara Anak Lake (2,000m). It took about three hours to trek down through steep trails to the crater lake. 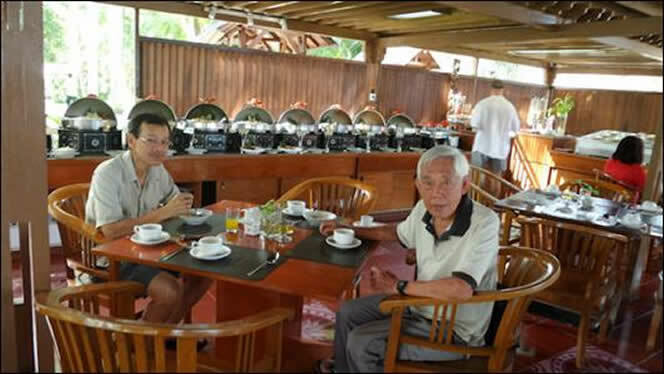 We had a swim and explored the pilgrimage hot springs while the porters prepared our lunch. 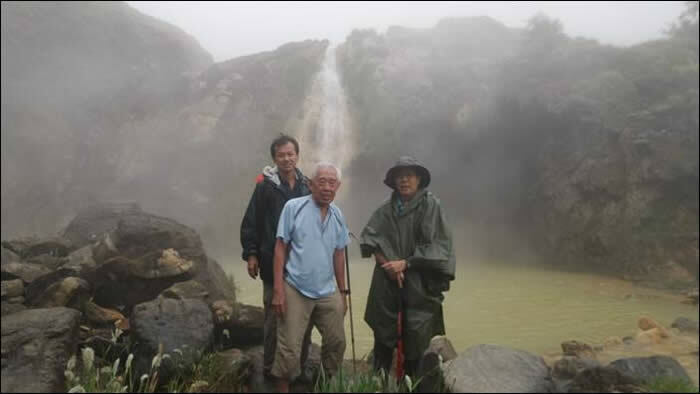 After lunch, we trekked for about three hours to the campsite at Plawangan Senaru Crater Rim at 2,461m. We started our long descend down to Senaru village (601m) through thick tropical forests. 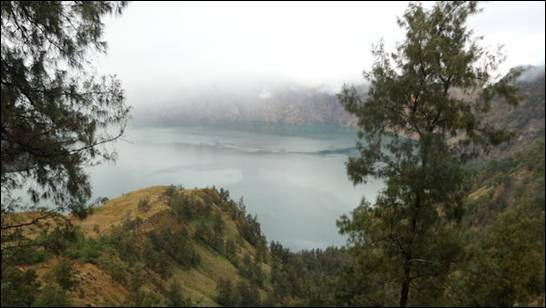 At the beginning of the trail, the views of the lake in Senaru Crater Rim were beautiful. We had a few rest stops along the way and lunch was served en route. The trail was wet and slippery, particularly where it was covered with tree roots. Though I walked down slowly and cautiously with my walking stick, my toe-nails were hurting. After tedious walking for more than seven hours from the rim we finally arrived at Rinjani Trek Centre at Senaru. A car was waiting to transfer us to Senggigi. We finally ended our trek! 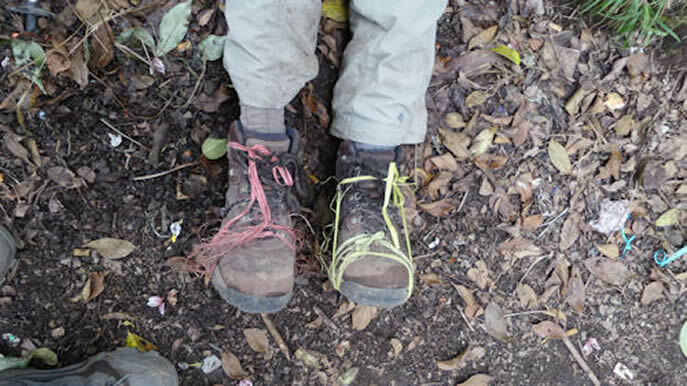 The soles of my boots came apart & had to be tied with string!